Letterpress identification. Is there any hope for revamping?? I found this old letterpress and cutter in a shed of a family friends. Can you tell me what kind it is and if there is hope for it? It looks pretty rusted out, but I thought i might be a fun project to clean it up and get it back in working order. The press is almost certainly a Chandler & Price (C&P). I can’t tell about the cutter - it may have an ID plate on it. Doesn’t look all that badly rusted to me — mostly surface rust. If the press and the cutter parts move, a bit of oil and some elbow grease with steel wool and maybe WD40 will get it looking good again. You’ll want to have the cutter blade sharpened. It looks like the press even still has its treadle, a major advantage. The press is heavy - looks like it might be a 12x18, probably about 1800lbs. If you want to print, there is your basic shop — you just need some type and a few other accessories. I’d say go for it! Thank you for your reply. I have been a member on here for years and have wanted to test the waters of letterpress for some time. I couldn’t believe my luck when I found this guy out of the blue. I have searched for cleaning instructions and found a few websites with basic instructions, but if you have any specific advice or websites with trusted information on renovating C&P’s I would LOVE to hear from you. Advice from seasoned professional is invaluable! Also, the cutter is a Paragon - it says E L Miller patent Oct. 21, 1879. The main operating lever on the cutter appears to be broken off. Could it be laying around in the shed? I’d agree with Bob, that it may be restorable. I don’t believe it has a treadle. The foot pedal is for a brake on the flywheel. It was originally equipped with a feeder, but should be easy to set it up with feed tables for hand feeding if the parts for the feeder are not available, or if you prefer handfed. Press appears to be a Miller with what was once a Miller feeder. Most likely a 12x18. I’ve seen a few of these around but never saw one actually running. 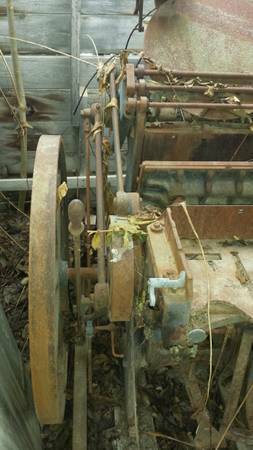 Forget about restoring the feeder and as far as the press, there are far too many C&P’s around ready-to—run that make this a waste of time to refurbish. Handle on the cutter can be welded if you find it. It’s on the left side and pulls to the right. Most Paragons were 22.5 and somewht light weight but still much better than a lot of these current Chinese/Japanese table tops. 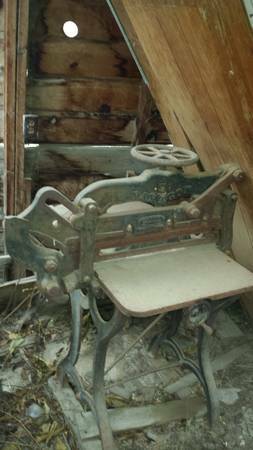 jhenry- are there companies that produce replacement treadles or is it something I would need to find used (which I am sure is very unlikely). Stanislaus Pekala- Here in Oregon a larger letterpress of any kind seems to be hard to come by for less than $2k or so. It is possible I might get this one for simply the cost of moving it, which seems like a pretty good deal. Do you think it will be too much work to restore as far as rust is concerned? I am not overly concerned about the feeder as I would be doing smaller projects. I have a background in graphic design and thought it might just be fun to try it in another medium. Do any of you have a good resource for restoration as far as a guide or instructions? Thank you to everyone for their help. check out The Excelsior Press web site, there is a world of info there. I don’t think the cutter handle shaft is broken, it looks like the rusty shaft is still there but the handle is not visible. May have been taken for another need or may simply have been removed to make the cutter safe and be somewhere near by. It’s shaped like a hockey stick. I guess what I thought was the treadle is some trash sitting on the board under the left feet. If this is indeed a press made for the feeder it probably does not have the crank in the flywheel shaft that would allow use of a treadle, but it would be worth checking for the crank, as a treadle can be made. But the press could be motorized and geared down for slow operation. 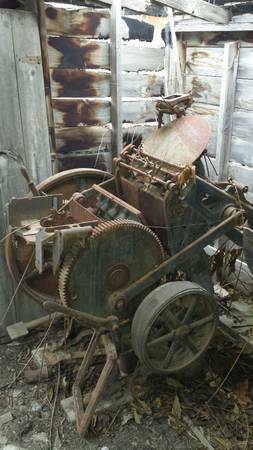 I believe I see both a treadle and a brake pedal. I also think it once had a feeder. A feeder would require that the press be motor driven. The flat belt pulley on the right side indicates it was motor driven. If what I see is a treadle, I don’t know why it was left on the press if the press was motor driven. Are you longer on money or time? I see these pieces as very doable for restoration. You will need new rollers. I am going to schedule some help to move these guys in the next two weeks and will update you with what I find at that point. Looking back I wish I would have paid better attention and looked around for additional parts, ect. I am hoping Inky is right about the completeness and can tell you it does have a motor. I think it was a Horton Manufacturing Company if that makes since? No idea if it works though. You know, I thought that large pulley looks like the Horton pulley that was discussed on here ;last week. If so that alone is probably work the effort. I think I do see the treadle now. This is what a Miller Feeder looks on a Chandler and Price Press. Last one I’ve heard of running was in a monastery in Tannu Tuva or Mongolia. I guess you might need Divine intervention and a real desire to spread the Word to operate one of these. I’ve just received word from an old товагюсцч in Mongolia telling me that Sarah Palin claims that she can hear that CP/Miller Feeder press from her back porch in Alaska. Another valid reason for Daylight Savings Time as we would not want to keep Sarah up and be late for grandson’s soccer game. The handle on the right is for the speed control. There are wooden pieces like old fashioned brake shows inside the drive pulley and the lever presses them inside the pulley to control the speed—-not very effective or safe in my youthful experience. If you have space and time why not have a go at restoring the old girl ,even if you only clean up its working areas and get it rolling if it will print then go for the strip and clean up ,personally i think you may find once the bearing areas are oiled it will free up and run , put you efforts into the really frozen or really bad areas to get her going and then do the rest as a running restoration . You dont even have to re paint the thing just get some bees wax and buff the bare metal with it ,even the bits that fine cutting compound wont clean can be acceptable when waxed over .